Christine Cutbush demonstrating a Feldenkrais technique for freeing up twists. I first came across Feldenkrais in a yoga teacher taught by a friend in Wellington – Oli Wiles. He was smitten with the technique and skilfully wove it through his yoga teaching to great benefit. Now that I’ve been practicing yoga for almost two decades, I’ve also become very interested in how the body opens up, or doesn’t open up. From my own experience I can see that it’s not a simple equation of doing x, y, or z posture enough times and achieving your optimum range of movement. I’ve discovered that there are many variables to increasing flexibility or ease within postures and that there is no definitive answer to the question How long does it take to get flexible with yoga? I’ve also discovered that often psychological shifts lead to physical shifts, just as physical shifts often lead to psychological shifts. Our minds and bodies really are as one, and when you add awareness to the mix, you have a fascinating experience of body/mind opening and shifting. Moshe Feldenkrais was an engineer, physicist, inventor, martial artist and student of human development. I love that combination of disciplines – take the analytical, science-orientated mind of a an engineer and physicist, combine it with the energy-awareness of a martial artist and mix it with a fascination with human development… and what do you get? Someone who immerses themselves in a life long exploration of the relationship between movement and consciousness. It was a knee injury that really set Feldenkrais on the road to better understanding movement and consciousness as he looked for ways to heal himself and restore full functioning of his knee. Concentration on the aim may cause excessive tension. Performance is improved by the separation of the aim from the means. To understand movement we must feel, not strain. Awareness is consciousness together with a realisation of what is happening within it or of what is going on within ourselves while we are conscious. Awareness is not essential to life. Awareness is a new stage in evolution. You can be conscious without being aware – and this is how most of us come to Yoga. Through our practice, when we become interested in what is actually going on inside of us, physically, emotionally, mentally and energetically, we become aware. That awareness is not essential to life – whether we are aware or not, we are still alive. This ability to be aware is a new stage of evolution. I could ponder this for days. And this is why working with Feldenkrais can inform our yoga practice so beautifully. Feldenkrais is coming at many of the concepts of yoga from a different perspective, plus he physically uses ways of movement which effortlessly increase our range of movement. In this short video with Christine Cutbush, a Feldenkrais practitioner and yoga teacher, she demonstrates how to effortless increase one’s range of movement in a reclining twist using a simple technique. There’s the before range of movement, her student Trudi does the technique, and then there’s a the after range of movement. I’d always thought that finding greater freedom in a reclining twist was a matter of effort, of finding the stretch and release. However, through this technique I can see that sometimes it’s about training the body to move in different ways. It’s about working with the nervous system and the origins of movement. If you’re teaching yoga and are interested in the interplay between breath. movement, thinking, feeling and the nervous system, I highly recommend reading some of Feldenkrais’ books or attending a training. In the meantime, watch this video to get a clearer idea of the power of Feldenkrais. 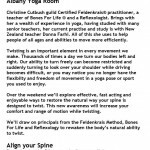 Christine Cutbush is Guild Certified Feldenkrais practitioner and experienced yoga teacher trained in many different styles including Sivananda, Yoga works, Iyengar and Ansura Yoga. Her training with Donna Farhi lead her to the Feldenkrais Professional training. Christine teaches a range of workshops in New Zealand, Los Angeles and Mexico including Easier Sitting, Lower Back Comfort, Align your Spine, Dynamic Twisting, Power to the Pelvis and the popular Happy Feet. 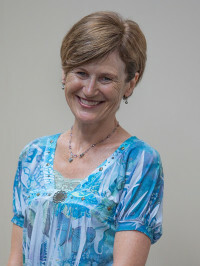 Christine is the co-founder of AIM, Awareness, Integration and Movement. 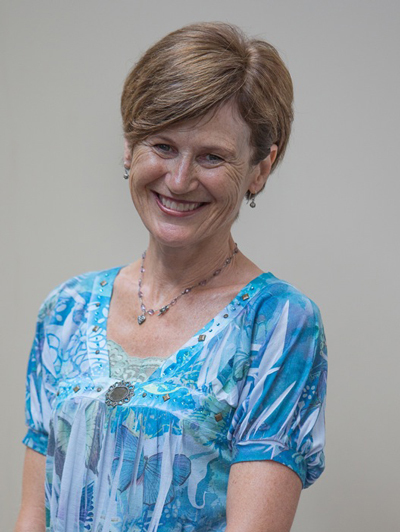 Her movement therapy training is extensive and spans over 18 years of collective education. She brings a wealth of information helping people of all ages and abilities to move more efficiently. Through her gentle nature and way of teaching, Christine enjoys helping people enhance their awareness of how they move enriching their lives. Check out Christine’s website here.